So I’m gonna let you guys in on a secret… I haven’t seen the original trilogy of Star Wars since I was a little kid. And as a little kid I didn’t like them enough, or understand enough to care. I always said that I would eventually watch them, but never got around to it. Well, an amazing thing happened. My local movie theater is doing an 80s at 8 every Thursday this summer, and this was the first choice. I tell you what, I never thought I would see these movies in theaters ever, and it was glorious. The music started, the words flew, and the audience cheered. I can only imagine that feeling times ten come December is what we will all be feeling. So I know it is the second one, but the first one is the only one I have seen repeatedly over the years. 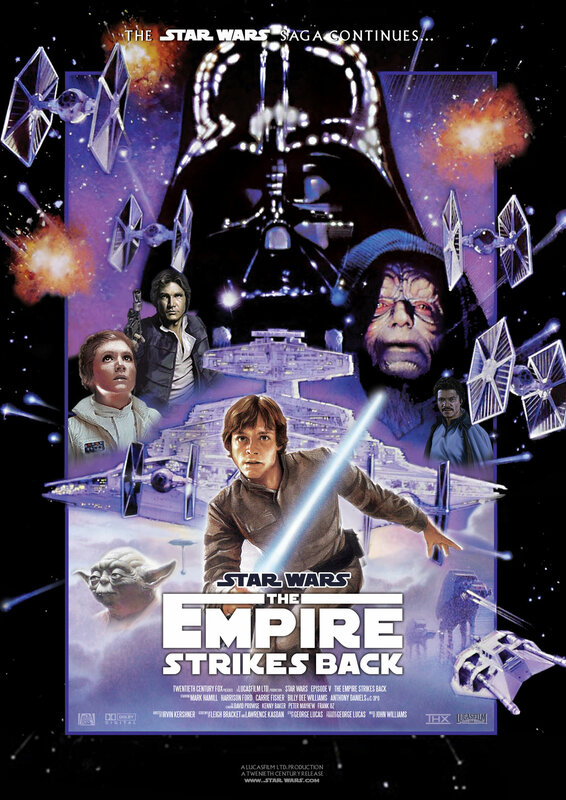 The Empire Strikes Back follows Luke, Leia, Han, Chewie, and the loveable droids as they try to escape the evil Darth Vader. This movie is 35 years old and I know the graphics are a little lacking, but I don’t care. The graphics were good in Transformers 2, but I’m going to watch Star Wars before that! I’m going to use character names instead of actor names, because they literally fell into their role. My favorite character was EASILY Han Solo, the wise cracking, ladies man, smuggler. The relationship between him and Leia is one of the best in movie history. Luke was great too, but I don’t feel he hit his stride till the end. Though I did love his training montage! I also see why an entire generation basically has a fetish for Princess Leia! I have a great deal of respect for the fact that the whole movie took place over a very short period of time, yet we traveled all over the galaxy without losing track of the point. And IF you have have been hiding under a rock for 35 years you will LOVE the twist ending! All in all this is a near perfect sci-fi movie, and a great movie that will be a part of history. Watch it.